"Ivan and his younger brother, Gordon, enjoyed a happy childhood, much of it associated with the Methodist Church. If Southall were to claim any serious literary foundation, it had to be the influence of the King James Bible, absorbed during after-dinner readings or in church." At the age of fourteen his father died and his life changed. This bright student was sent to work washing bottles and glassware. He later became a copy boy at the Melbourne Herald. He had an early ambition to become a journalist, but the Herald gave him an apprenticeship in process engraving. However, this gave him entree to journalism and writing and in his spare time he began to write fiction. In 1945 Southall married Joy Blackburn and they lived on a property in the Dandenong Ranges. They had four children together and in 1962 Joy gave birth to their fourth child, Melissa who was diagnosed with Downes Syndrome. Raising a disabled child had a strong influence on the whole family and can be seen reflected in Southall’s writing in books such as Finn’s folly and Let the balloon go, both of which involve disabled protagonists and consider the impact of their disabilities on their families and their ability to cope and survive. In 1974 Ivan and Joy were separated and divorced in 1976. Southall married Susan Westerland Stanton in 1976. Ivan Southall had completed four books before he was twenty, three of which were not published until after the Second World War. Southall was a pilot during World War II, the captain of a Sunderland flying boat based at Pembroke Dock in Wales. He was awarded the Distinguished Flying Cross for sinking a German U-boat in 1944. His wartime experiences obviously had an impact on his earliest post-war writings. 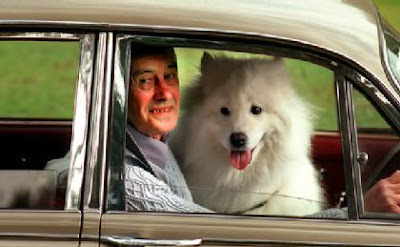 'Full Throttle for Fortune' (the original title, that was replaced with 'Meet Simon Black') was his most ambitious earlier work and was the genesis for the Simon Black series about a brave pilot, his mate Goggles Grant and his dog, Rex. Many men over the age of 50 will have wonderful memories of his Simon Black Books for boys published between 1950 and 1961. 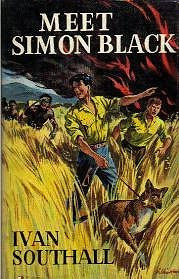 These very popular adventure books (published in Australia by Angus and Robertson) have fast action focussed on the larger than life central character Simon Black. They included 'Meet Simon Black' (1950), 'Simon Black in Peril' (1951), 'Simon Black in Space' (1952), 'Simon Black in Coastal Command' (1953), 'Simon Black in China' (1954), 'Simon Black and the Spaceman' (1955), 'Simon Black in the Antarctic' (1956), 'Simon Black Takes Over' (1959) and 'Simon Black at Sea' (1961). Southall's book 'Hills End' (1962) widespread critical acclaim both in Australia and overseas and launched Southall's international reputation. The book is about a group of children facing a crisis without adult supervision. This is a theme that he repeated in many other titles (e.g. 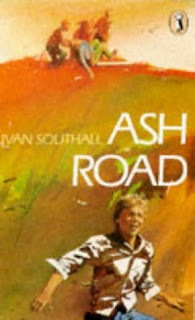 see 'Ash Road' below). In the ten years that followed Southall published some of his most successful and awarded children’s novels, including Ash road, To the wild sky, Finn’s folly, Chinaman’s Reef is ours, and The foxhole. In this period the idealistic hero of his Simon Black novels was replaced with much more complex and recognisable characters. In this period he also experimented with a number of different narrative techniques, using for the first time the interior monologues found in Let the balloon go, Bread and honey and Josh. At the same time he also received severe criticism for his challenging subject matters that were frequently 'on the edge' of acceptability for some parents and librarians. I can recall reading As Road as a child at primary school and the excitement and fear that the strong narrative engendered. The story is about some children living on Ash Road who are confronted with the fear that many face in rural Australia, the bush fire. The pattern of the day was like that for most Australian fire disasters (including the recent fatal Victorian fires). Southall paints a literary picture of a bewildering and fearful day. The unnatural heat of early morning, the roaring northerly wind and the smell of smoke across thickly wooded hills. Next the panic of communities, the noise of sirens wailing and adults behaving (in the eyes of children who have not experienced this before) so strangely. Conversations overheard of large fires too far away to see. Finally, the realization that nearly all the adults had gone and that a small group of children, were cut off amid growing confusion and danger. The story tells of how they face the danger with only two old men to help them. Southall's grasp of language and his ability to use it to create fear, anxiety, joy and courage is on display in this wonderful book. While it is set in another age, today's children will still find this a gripping tale. This is the story of a boy's four-day visit to his Aunt Clara the in Ryan Creek (a town founded by his great grandfather). He has difficulty relating to the other children in this remote rural community and discovers what it means to be an outsider with no awareness of what he needs to do to gain acceptance. He finds himself so different to these children who see the world in different ways and who set out to embarrass, humiliate and shame him. Any child, who doesn't quite fit the mould, will be able to relate to Southall's character. As always he creates in the book rich and believable characters that engage you and draw you into their lives. While he also creates authentic and interesting Australian settings (another strength of his work), it is the depth and complexity of his characters that separates Southall from many other lesser writers. His word craft is also masterly and is seen at its best in this book that achieved what no other Australian children's book has managed, the United Kingdom's highest award for children's literature, the Carnegie Medal (1971). Ivan Southall's youngest daughter Melissa and her life coping with disability were central to 'Let the Balloon Go' (1968) and also 'Finns Folly' (1969). The main character in the Let the Balloon Go' has cerebral palsy and has overprotective parents, a twelve-year-old, left alone for the first time. He tries desperately to assert his independence and as a result does exactly what he has been forbidden to do. The book is one of Southall's most successful novels for younger readers and is just as relavant today. The book was also made into a film in 1976 (click here) that was produced by Film Australia. 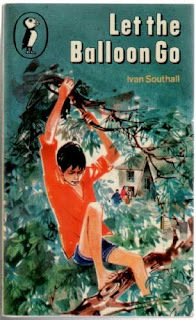 As well as the Simon Black series Ivan Southall published twenty-eight children’s books, and a number of adult novels and numerous essays and short stories. His work for children has been translated into over twenty languages including German, Swedish, Japanese and Russian. His numerous awards included the Children’s Books of the Year Award for Ash road (1966), To the wild sky (1968), Bread and honey (1971) and Fly west (1976). He also won the Children’s Picture Book of the Year for Sly old wardrobe (1969) that was illustrated by Ted Greenwood. 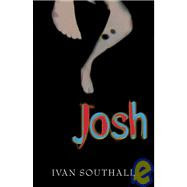 He is the only Australian children’s writer to receive the Carnegie Medal (for Josh), which was also an honour book for the Hans Christian Andersen Award. He was made a member of the Order of Australia in 1981. He also won the Emeritus Award of the Australia Council Literature Board in 1993 for his contribution to Australian literature. In 2003 he received the International Phoenix Award of the American Library Association (Children's Literature) for The Long Night Watch. He was also awarded the Dromkeen Medal in 2003 for his writing that spanned 50 years. While much of Southall's work was written in different times and for readers with vastly different lived experiences than today's children his books are just as relevant today as they were when he first wrote them. Boys of today will also enjoy the insights that his work gives into the life of young boys (in particular) in the 1950s to 1980s, and a world with some differences from their own. 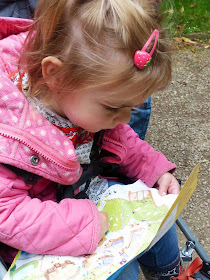 Readers of this blog may recall that I provided a brief review of 'Your Baby Can Read' (YBCR) in July last year (here). 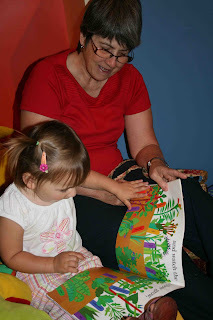 YBCR is a successful reading program designed for toddlers. My first post created a lot of interest with over 10,000 viewings and many comments. It had never been my intention to offer an extensive review of the program; in fact, I wrote it in response to a simple reader's question, “Is it a good idea?” However, the many comments on the post suggest that there is strong interest in the program and varied views on its usefulness. I have written this post as a follow up to the previous discussion. I apologise in advance that it is VERY long as a blog post but hopefully some will find it helpful in full and others can skim. I indicated in my last post that YBCR is primarily a word recognition program designed for children as young as 12 months. It aims to teach children to recognise words by ‘sight’ (instant word recognition), with the words being taught using a variety of stimulus materials including DVDs and word and picture cards. As with any sight word program, the child is taught to use visual clues such as the shape of the word, and some aspects of letter configuration (e.g. an initial letter, an unusual ending) to identify the word instantly. The program developer suggests that YBCR also seeks to develop incidentally some phonic skills as a by-product of the repetition of sight words, but the program does not systematically teach phonics. First, the program does not teach children to ‘read’ in the fullest sense of the word, rather it teaches them to recognise instantly a number of words. As I outline in a previous post (here), to be an effective reader any child ultimately needs to: learn the sounds of language and their correspondence with print; understand the structure of language and how it works; learn how to use language appropriately for specific purposes; and learn to comprehend, interpret, use, appreciate and critique written texts. The program is focussed on one strategy for instant word recognition. While some of the supporters of the program (as seen in their comments on my last post) claim that it teaches children incidentally about sound-symbol relationships, the program does not teach phonics and claims that it does help such skills are not backed by research. Second, if you introduce this program at ages as young as 12 months (as suggested by Dr Titzer) you are essentially introducing the child to formal instruction 3-4 years before what has traditionally been the practice. While Dr Titzer suggests that an early introduction to written language in the form of his program will accelerate learning, he does not provide any evidence to support the claim. I pointed out that the country that has some of the best literacy results in the OECD is Finland, a country where just 9 years of school education is compulsory and where it doesn’t start till age 7! Third, in introducing a program like 'Your Baby Can Read!' you are essentially devoting time to structured repetitive learning of a limited type that would probably replace other forms of learning. I asked parents to consider what they would stop doing while using the program. In addition to my own comments, a number of readers of my first post also offered their own additional points. There were many comments mostly based heavily upon personal experiences of one kind or another. I tried within the limits of the space one has in a blog comment to respond to the various issues one by one. Some suggested that I am opposed to early stimulation of literacy; this is not the case. What is at issue here is the nature of this early stimulation and whether some types of early accelerated learning might be harmful. At the outset let me say there is limited evidence in either direction in relation to children of this age. My own view is that I would not begin formal instruction too early based on wider research on literacy, learning and development. Not all readers of the blog agree. In fact, embedded within a number of challenges to my first post were questions about the value of accelerated learning and the suggestion that I should comment further on this issue. A number of the comments made by readers of the first post have led me to write this second post. Please note that I am not writing this post for a research journal so it is not meant to be comprehensive in nature, nor is it referenced like a research paper. Rather it represents a synthesis of the major trends and outcomes of research in this area. Acceleration is the practice of speeding the progress of children through school grades and/or providing them with programs, activities or learning experiences typically experienced by older children. Acceleration can take many forms including early school entry, grade skipping, introducing children to academic skills such as reading much earlier than usual etc. In effect, using 'Your Baby Can Read' with your child at age 12 months is an example of acceleration. Most of the research on acceleration has been conducted with children aged 6 years and above and relates mostly to institutionalised education. Research on the acceleration of gifted children is generally accepted to be harmless for most children when the child is carefully selected and appropriately taught. The evidence (in general) also suggests that there are benefits for gifted children when the practice is adopted and some negative impacts when bright children are left in ungraded and unstimulating classes. Terman’s (1925) earliest study pointed in this direction and others have achieved similar broad findings, for example Kulik and Kulik (1982, 1992), Grose (1993), and Rogers (2004). However, questions still remain in applying this type of generic support for acceleration to approaches to the education of older children in formal settings, to a program like 'Your Baby Can Read' designed for very young children. Why, you ask? Here are a few reasons. First, the studies cover so many different versions of acceleration (e.g. grade skipping, more advanced work, early school entry etc), that assuming a general effect for a program like YBCR may not be appropriate for your child. Second, research looks for trend data, uses mean scores, and general patterns. This 'smooths' the effects so that the varied ways in which examples of acceleration impact on individual children are masked. For example, in one pro-acceleration study at the Johns Hopkins Center for Talented Youth conducted in 1994, it was found that while 95% of the 175 participants perceived positive consequences of acceleration, almost 50% perceived some negative consequences and 2% reported only negative impacts. Neihart (2007), who supports acceleration, when examining socio-affective effects makes this point, reminding us that in spite of benefits from acceleration, "some accelerated gifted children do exhibit problems with conduct or mood." As well, she reminds us that there are documented cases of individual accelerated children having adjustment problems, and hence we cannot conclude that all gifted children should experience acceleration or enter kindergarten early. However, she suggests that the conclusion that academic acceleration will cause social or emotional harm to gifted children is not supported by research in relation to grade skipping, early admission to kindergarten or school “…we cannot make similar claims for other accelerative options, because they are not as well researched”. The main point to be made here is that parents need to make choices about acceleration based on their individual child and not assume that the benefits are uniform and that negative impacts don’t occur. Second, many of the studies rely on qualitative research with less than rigorous methodology (Note: I'm not suggesting that qualitative research is generally non-rigorous). This is particularly the case in relation to emotional and social development, but is also the case (to a lesser extent) for academic development of young children. The research generally doesn’t control for pre-existing differences between subjects and often uses data in the form of student perceptions rather than measured psychological changes or behaviour. Most of this research is also descriptive and correlational and often participation is voluntary rather than random, making comparability more problematic. The same can be said for academic effects for young children. Third, how studies define academic and social/emotional development varies greatly making comparisons between studies more difficult. This is particularly the case with the muddy term social and emotional development where studies use a variety of indicators (e.g. antisocial behaviour, leadership ability, self concept, peer relations, absence or presence of psychological problems variously described) and so on. Fourth, in relation to assessing the impact of a program like YBCR, and in fact any home-based intervention, it is virtually impossible to control for variability in relation to approach, frequency and conditions. This limits our ability to make judgements about the likely impact of such programs for all children. Fifth, the evidence in relation to the age at which formal instruction begins for literacy does not support the idea that starting early gives a long lasting positive benefit for children. b) What developmental psychologists have to say? While maturational theories have been critiqued at length in recent decades we cannot ignore the work of psychologists like Piaget whose work has been so influential in early childhood education. Piaget’s work and in particular, his notions of stages of development, have been badly interpreted at times. For example, we should reject the common assumption that stages of cognitive development are relatively fixed, that they unfold in a linear and automatic way, and that specific stages should be reached before children are ready for specific cognitive tasks like reading. Piaget never wrote this and in fact stressed that development involved an interaction between the child and their social and physical world. 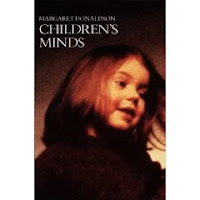 Margaret Donaldson provided one of the strongest critiques of the notion that developmental stages are fixed (here). Similarly, the application of the work of constructivists like the Russian psychologist Vygotsky (see my related post on scaffolding here and a helpful video here) has helped to underline the fact that development is not fixed. Vygotsky saw a much closer relationship between learning and development and indeed argued that learning affects development. Of course, this doesn't mean that it is appropriate to thrust any learning experience on a child whenever one we feel like it. Development is by definition progressive in all children, some tasks are more complex than others, some skills more abstract than concrete thinking, and language can be literal or metaphorical and so on. We cannot simply assume that children can do anything when we want them to without regard to their pre-existing skills and ability. Furthermore, we cannot assume that pushing our children into new areas of learning before they have important foundational skills won’t have an impact on them. Piaget’s observations of children are consistent with the experience of parents and teachers, which is why the notion of clear stages became so firmly entrenched. The general observations, in effect, locked some teachers into thinking that this is the way it must be for children. While this view is not justified, we cannot ignore the observations of Piaget that in general terms the young child (up to roughly 2 years) is focused on sensorimotor learning and early language learning. At this time children are trying to learn how to move, use their hands and feet to manipulate objects, make sounds, exploring their world through all the senses and communicate with other people. From age 2 most children grow quickly as language users, learning that symbols can convey meaning and later trying to use symbols to do just this. They also begin to understand the difference between reality and fantasy, and to use objects as tools. From early school age most children begin to understand that they can manipulate symbols, make judgements about concrete or observable phenomena and manipulate them for their own purposes. Learning is still very concrete for the primary age child but an understanding of abstraction develops for most children. By the teenage years the child no longer needs concrete objects to make rational judgements, by this age they are capable of hypothetical and deductive reasoning. Teachers and parents need to take care in assigning work to their children that is too difficult for them or inappropriate. The work of Vygotsky has shown that learning occurs best when the activity or task is within what he calls the child’s ‘zone of proximal development’ (ZPD). Vygotsky demonstrated that children learn not when doing things that are too easy (and repetitive), or when too difficult and frustrating, but when the task is just in advance of their capabilities. The best learning activities for your child are not necessarily those which they can complete alone, but rather, those which are a little in advance of their ability, which with help and support from a more skilled person (typically an adult), they can complete successfully. One of the difficulties that I have with 'Your Baby Can Read' is that it places so much emphasis on sight word recognition, repetitive learning and memorisation. All have a place in learning but their predominant use at such a young age may divert time from other useful activities such as language stimulation, being read quality literature, discovery learning that stimulates problem solving and inquisitiveness. While some of the comments made in relation to my last post suggested that Titzer encourages parents to stimulate decoding skills and to use literature, the fact is that the primary focus of the program is whole word recognition. This approach while relevant and useful should always be used with other approaches such as decoding and phonics and more holistic approaches such as language experience (see my earlier post on it here), and the reading of quality literature to and with them (see my post on this topic as well here). Some suggested in their comments to my first post that I was reducing this discussion to a debate between whole language and phonics, with my bias being towards phonics. I have been accused at times of stressing holistic approaches but never of being an apologist for phonics-based strategies. The reality is that my own research and writing have always demonstrated a concern for balanced approaches to literacy instruction (see for example my book 'Balancing the Basics'). This was the methodological concern that I was raising in my last post, that is, that YBCR relies predominantly on a relatively limited reading strategy. While whole word recognition can teach children to memorise and recall isolated words, the approach at best is a useful supplement to other strategies. One of my over-riding concerns with approaches like YBCR is that children at a very young age are being placed under the pressure to learn material using repetitive memorisation traditionally not encountered until years later within the context of formal education. I’m not convinced that the evidence for acceleration at later ages and in typically formal education settings is relevant to children aged 12-24 months at home who have not been professionally identified as gifted nor assessed in relation to their needs as learners. My view as expressed in my last post is one that I still hold, I have concerns about unintended effects of ‘hot-housing’ (i.e. intense study to stimulate a child's mind) by parents at home with limited training and knowledge of language development and learning. 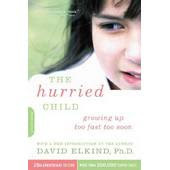 This is not a new view; in fact David Elkind devoted a whole book to the subject in the 1980s, ‘The Hurried Child’ (1981) in which he warned against the tendency for some parents to want to accelerate their children’s progress prematurely. Elkind (1986), Sigel (1987) and Minuchin (1987) are amongst those who have stressed that children need time and appropriate learning strategies to develop normally. Elkind also warned against the temptation to pressure children with simplified learning tasks at a very young age which inevitably end up relying on lower-level cognitive processes such as memorisation, repetition and simple word and sound recognition that could ultimately be at the expense of activities with greater richness and complexity. This has been a very long post but I want to stress just a few points in summing up. Parents who want to give their children a head start in life are using 'Your Baby Can Read'. This is a good motivation, but being well motivated does not equal being right. I have argued over two posts now that I have significant doubts about the wisdom of introducing children to a sight word program like YBCR at the age of 12-18 months, this does not mean that I don't see value in what it is trying to do for older children. There is little evidence to support the long term benefits of the program being used at such a young age, nor has there been sufficient attention to research that could discount any potential negative effects. This research should be done before parents can confidently use YBCR with total confidence. While there is evidence to support the benefits of acceleration for older children when learning in institutional settings, we should not assume based on this evidence that the research offers support for the use of YBCR. While I didn't comment on Glenn and Janet Doman's work, most of my comments about 'Your Baby Can Read' could also be made about the materials and adaptations based on their book (here). Here's one example (click here). One view on the problems with hot-housing (click here). This post is a recap of two posts I wrote early in 2008. Given the importance of play I thought I would revisit the topic. I mentioned in my first post on play that psychologists, educators and paediatricians see it as so important to optimal child development that it has been recognized by the United Nations High Commission for Human Rights as a right of every child. But in a clinical report to the American Academy of Paediatrics, Kenneth R. Ginsburg concluded, "Many of these children are being raised in an increasingly hurried and pressured style that may limit the protective benefits they would gain from child-driven play." Major child rearing agencies, early childhood associations, paediatric groups, and government agencies with responsibility for children and families have been raising serious questions about declining spare time, and in particular unstructured playtime for young children. For example, in a recent edition of the Belfast Telegraph a report from 300 teachers, psychologists and children's authors claimed that the erosion of "unstructured, loosely supervised" playtime is dangerously affecting young people's health. Through play children at a very early age engage and interact in the world around them. When play is allowed to be child-driven, children practice decision-making skills, move at their own pace, discover their own areas of interest. a) Children benefit from play with adults, and there are advantages in the experience of play situations with varied adults. c) Adults can enjoy play too and learn how to engage with children and learn about children as they too enter into shared play situations. 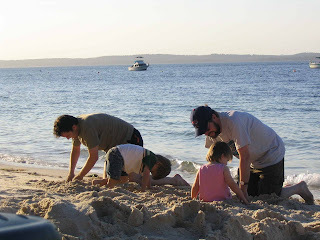 This post is based on two initial posts on play, you can read a third post on how adults can engage in play situations with their children here. The major children’s book awards in the USA are the Newbery and Caldecott Medals. The winners of both awards were announced recently. This is a quick review of the awards and the outcomes this year. The Newbery Medal is without doubt the most prestigious award for children’s literature in the USA and is known internationally. The Newbery Medal was named after the eighteenth-century British bookseller John Newbery. The Association for Library Service to Children (ALSC) awards it annually; this is a division of the American Library Association (ALA). It is presented to the author of the book judged to have made the most distinguished contribution to American literature for children. A committee of librarians and literary experts is chosen each year to select the winner and the runners up. The books can be works of fiction, non-fiction and poetry. The author must be a citizen or resident of the United States and the work written for children up to and including 14 years. Worthy runners up are acknowledged as Newberry Honour books. The Newbery Medal was first announced in 1922 and was the first children’s literature award developed in the world. Though the Newbery Honour book list was not initiated until 1971, previously cited runners-up for the Newbery Medal were named retrospectively as Newbery Honour books. The full list of previous Medal winners and honour books can be found here. The Newbery Medal this year will cause much discussion given its content. The winner is 'The Graveyard Book' by Neil Gaiman (Harper Collins Children’s Books). Dave McKean illustrated it. Gaiman is renowned for his science fiction, fantasy and graphic novels. He is well known for his 'Sandman' adult comic-book series. He reportedly worked on the "Graveyard Book" off and on for more than 20 years. He is author of more than 20 books and the winner of prizes for science fiction, fantasy and horror. 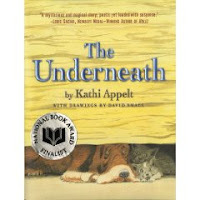 'The Underneath' by Kathi Appelt, illustrated by David Small (Atheneum Books for Young Readers). In a story that touches on significant themes such as love and hate, a hound dog befriends an abandoned calico cat that is about to have kittens. The dog urges her to raise her kittens underneath the porch of his owner's house, where they will be safe, as long as they stay in the Underneath. 'The Surrender Tree: Poems of Cuba's Struggle for Freedom' by Margarita Engle (Henry Holt and Company). Engle uses compelling free verse in alternating voices to tell the story of Cuba's three wars for independence from Spain. She combines real-life characters (e.g. legendary healer Rosa La Bayamesa) with imaginary characters. 'Savvy' by Ingrid Law, (Dial Books, Penguin in partnership with Walden Media). The book is a first-person narrative that takes readers on a wild bus ride, winding through the countryside on a journey of self-discovery for Mibs Beaumont and her companions. 'After Tupac and D Foster' by Jacqueline Woodson (G.P. Putnam's Sons, Penguin). This story focuses on two years in the life of a New York City neighbourhood. The novel shows how life changes for two 11-year-olds when a new girl joins them. The girls form a bond around Tupac's music and build a friendship that impacts on their own identities. The Caldecott Medal was named in honour of nineteenth-century English illustrator Randolph Caldecott. The Association for Library Service to Children (ALSC) awards it annually to the artist of the most distinguished American picture book for children. The awards commenced in 1938. The art features richly detailed black-and-white scratchboard illustrations that are illuminated with touches of watercolour. As with the Newbery Medal, a number of distinguished runners up are named as Caldecott Honour books. ‘A Couple of Boys Have the Best Week Ever’, written and illustrated by Marla Frazee (Harcourt, Inc.). This book features detailed, subtly retro cartoons, which the artist uses to make fun of adult expectations as two friends experience a parent-free summer adventure. 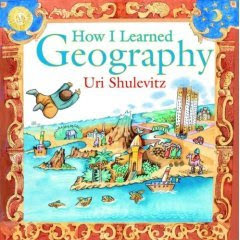 ‘How I Learned Geography’, written and illustrated by Uri Shulevitz (Farrar Straus Giroux). This book recounts memories of the author’s family flight from the Warsaw Blitz and his years as a refugee during World War II. He uses watercolour and ink to depict a boy who is inspired by a map his father buys in the village market. ‘A River of Words: The Story of William Carlos Williams’, illustrated by Melissa Sweet, written by Jen Bryant (Eerdmans Books for Young Readers, an imprint of Wm. B. Eerdmans Publishing Co.). Sweet uses a mixed-media collage and simple watercolours to complement the author’s text to reveal the ordinary, yet extraordinary, life of Williams, a doctor and poet.